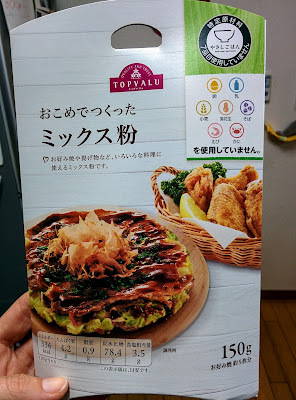 Lately some Japanese grocery stores have cottoned on to the fact that not everyone can eat everything. Enter Aeon's allergen-free series of mixes--this one is a baking mix for making savoury okonomiyaki (like meaty and cabbage-y pancakes) or for coating fried chicken. It contains rice flour, brown rice flour, potato starch, salt, and baking powder. Perfect pour moi! 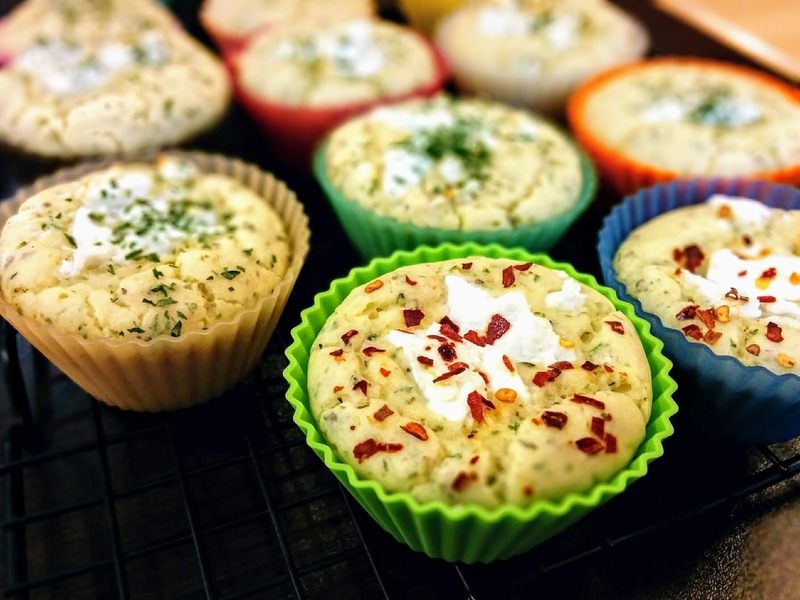 So I experimented, and here are some mighty delicious herby muffins with goat cheese (and red pepper flakes for those who so desire--I do desire, thanks). In a large bowl, mix all the dry ingredients together, and in a separate bowl, whisk the wet ingredients together. Then add the wet into the dry and stir 'em up. Spoon into greased or lined muffin tins, or use reusable silicone muffin cups like I do. Top with some crumbled goat cheese, more dried parsley, and red pepper flakes if you like (me likey). Bake at 350 F/170 C for about 12 minutes or so. These are great with the salmon chowder I've been making a lot lately. Canned salmon is something I keep on hand at all times for soup or salmon croquettes, and I found this recipe kind of recently that we all enjoy. But I do it differently, partly because I don't use dairy milk and cheese, but also because it's hard to find dill here and I haven't tried to grow any. Here's what I do. Saute the veggies in grapeseed oil in a big stock pot, then add in the water, bouillon, salt, pepper, and parsley. 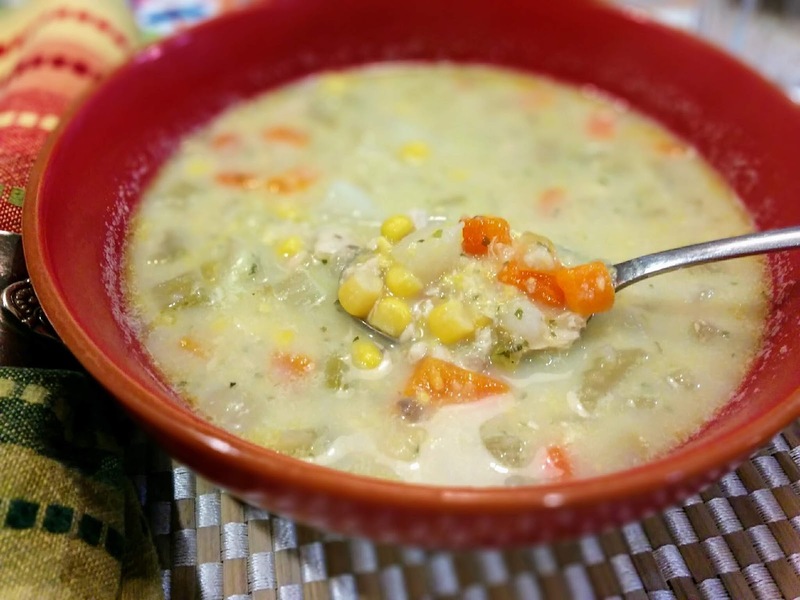 Boil till the veggies are soft, then add in the broken-up salmon, corn, pureed corn, and then a cup or two of milk. Serve with corn muffins if you have them, or herbed goat-cheese muffins (recipe to come). When I find endive on the sale table in the produce section of the grocery store, I make this salad. 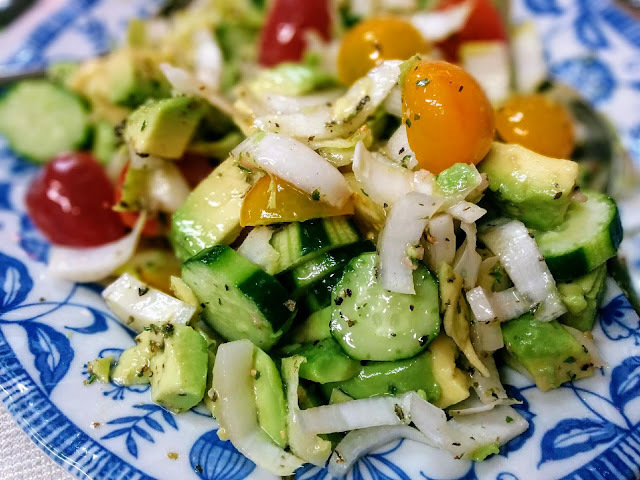 It's so more-ish with the sweet tomatoes, crunchy-fresh cucumbers, creamy avocado, and bitter endive. Slice and dice, then mix with the dressing and serve at room temperature so you can taste all those great flavors and textures.